Hollywood Boulevard can be overwhelming with lots of people and places to see. Let us take care of you like a celebrity. We will explore the Walk of Fame and share fascinating history about Hollywood- past and present- while you enjoy some diverse comfort food. This tour is not suited for vegans or a gluten-free diet. Guests will be led on a route of about 5-6 eateries on roughly seven walking blocks. The tour lasts about 4 hours. 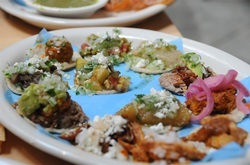 Enjoy over 10 unique tastings that may include Thai street snacks (Bhan Kanom), fresh radish and corn tostadas (Running Goose), chicken korma rice bowl and mango lassi drink (Urban Masala), chicharron de queso, mini braised meat taco and sope, and horchata (Loteria Grill), macaroni and cheese pie and seasonal sweet pie (Pie Hole), "voted best acai bowl in Canada" (Body Energy Club), artisanal gelato pops dipped in chocolate (Vanato Gelato), and old-fashioned caramel milk shakes (Mel's Drive-In or 25 Degrees). The tour begins at the Hollywood and Vine metro station (6300 Hollywood Blvd. Los Angeles, 90028). The tour guide can be identified by the canvas bags with 'Six Taste' on the sides that he or she will be carrying. While there are several parking structures in Hollywood, here are suggested lots: 1715 Wilcox Ave for $10-20 daily and LA City Garage 1627 Vine St. for $13. Parking rates are subject to change. The end location is 0.9 miles from the start (20-min walk). We end by the Chinese Theater to allow for self-exploration of all the Hollywood attractions after the tour. However, the tour guide will be happy to walk you back or direct you to the Metro to get back to the start location ($1.75). HIGHLY RECOMMENDED: Take the Red Line to the Hollywood / Vine stop. For information about schedule and fares, use the Metro trip planner at www.metro.net or call 323.GO.METRO. Ticket prices start at $65 per person, which includes all food tastings and guided walking tour. The amount of tastings on the tour is equivalent to a full meal. **In the tourism industry, it is customary to tip a standard gratuity of 15% to 20% of the retail price of the tour. If you enjoyed your time on the tour, please be sure to take care of our tour guides. Tickets are non-refundable. If you need to reschedule, you must contact Six Taste at least 2 weeks in advance. Otherwise, there are no refunds, credits, or exchanges for no-shows. Six Taste reserves the right to cancel tours due to low attendance. In this case, you will be notified and refunded the evening before the tour date. Water since not all stops may have water readily available, sunscreen, comfortable walking shoes, cash for any desired purchases, a camera.